« BOUTIQUE Westside Vancouver APERTURE Condos & Villas located in the Oakridge Neighbourhood from mid $300’s! Unique Architecture & Design! Located at Sexsmith Road and Hazelbridge Way Richmond Concord Gardens Park Estates is Phase 2 of this brand new master planned condominium community in the heart of the Lower Mainland. Offering amazing on-site amenities (both indoors and outdoors) in addition to superb condo homes, the Park Estates at Concord Gardens Richmond will feature a residential tower with 245 suites. Presale pricing starts from an affordable $270,000 range with maintenance fees in the approximate $0.38 per square foot range which includes central heating and air conditioning. 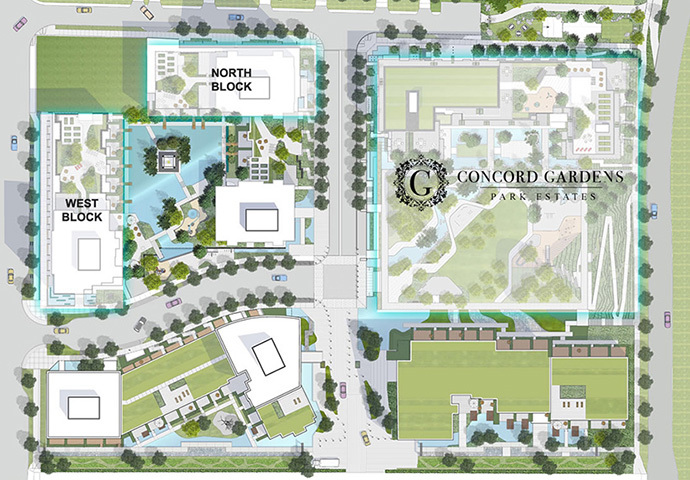 Concord Gardens is the largest world class community in Richmond BC! Much like the first phase release, the Concord Gardens Park Estates Richmond condo features are high-end, elegant and timeless. The ‘Smart Features’ includes four interior colour palettes that are named Manhattan, Impression, Hamptons and Reflections. Most of the floor plans feature outdoor living space and the main living areas will have wide plank laminate floors. The homes will have laundry closets with washer/dryer (stacked) and beautiful carpet in the bedrooms. The new Richmond Park Estates at Concord Gardens community will also feature roller shades on all windows, air conditioning in every principal room and closet organizers. All bathrooms will have laminate vanity cabinetry with soft closing hardware, under mount sinks, recessed pot lights, dual flush toilets and engineered quartz stone counters. The main bath or ensuite (depending on your floor plan) will feature custom medicine cabinetry, tub with marble tiled apron front, shower rod, polished chrome Kohler faucet, tub spout and shower head in addition to marble tiled flooring. The kitchens at the presale Richmond Concord Gardens Park Estates condos will include laminate cabinetry with open glass display shelves, under cabinet task lights, track/pot lights, marble tiled back splash, engineered quartz stone counters, cabinetry with soft closing mechanisms, magic corner and waste recycling bin system. Also, the kitchens for the smart finishes includes under mount stainless steel single bowl sink, Kohler faucet and an integrated stainless steel appliance package. Wherever applicable, the Park Estates Richmond condos will feature powder rooms that also have quartz counters, laminate vanity cabinet with soft close drawer and dual flush toilet. Also of note are the ‘premium’ features and finishes at the new Concord Gardens Richmond Park Estates condos. These premium high-end finishes are even better than the smart finishes and includes wood veneer cabinetry in the bathrooms and kitchens, higher end Miele appliances in the kitchen and other upgrades. As part of the master planned Concord Gardens Richmond real estate development, home owners at the Park Estates will have access to the Concord Gardens Club amenity spaces that span both indoors and outdoors. Some of the highlights of the club amenities include an expansive 70,000 square foot community park with water features, trails and seating areas in addition to a fabulous indoor swimming pool with Whirlpool for year round fun. As well, the Richmond Concord Gardens Club at the Park Estates community will feature a hot tub, steam room, sauna, private spa room for treatments in addition to a gymnasium that will be available for badminton and basketball. The Concord Gardens Park Estates amenities will also include a fitness gym, climbing wall, bowling alley and even an indoor golf simulator. For movie screenings and for big sports events, there’s a movie theatre room and there is also a music/karaoke room on site. Other amenity spaces at the Richmond Concord Gardens Club includes a banquet hall and grand ballroom, sports lounge and games room in addition to a study/reading room with internet access. For entrepreneurs and those who work from home, the Club Amenities also includes a meeting room. Other unique and five star amenity spaces at the Park Estates Concord Gardens includes an outdoor lounge deck with great seating areas, dance studio, children’s play area, a beautiful Lantern Pavilion and a games room. There is also a yoga/pilates studio on site. How central do you want to be in the Lower Mainland? If the answer is ‘central’, then the new Concord Gardens Park Estates condos in Richmond’s north end will certainly be the best choice for new presales in 2014! Just 15 minutes away from downtown via the SkyTrain in addition to being just 7 minutes away from YVR and 6 minutes to Richmond Centre from Bridgeport SkyTrain Station along the Canada Line, this brand new community of fabulous new homes is ideally situated in the heart of it all. 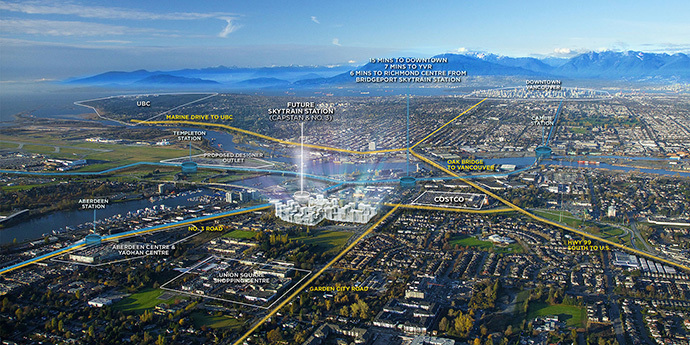 As well, just next to the new Richmond Park Estates at Concord Gardens is the future SkyTrain Station at Capstan & No. 3 Road. Some of the major thoroughfares for vehicle traffic are also nearby including Garden City Road, No. 3 Road, Oak Street Bridge to Vancouver and Marine Drive to UBC. Some of the other neighbourhood highlights include Union Square Shopping Centre, Aberdeen Centre, Yaohan Centre, CostCo and the proposed future Designer Outlets! As well, the Concord Gardens Park Estates Richmond condo building will be located in the north east side of the development site. 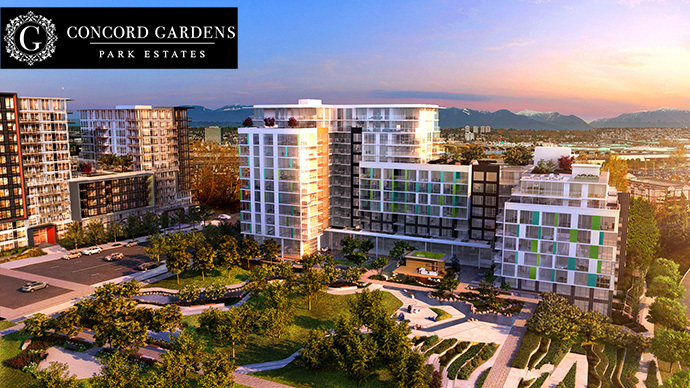 Located at the true centre of Richmond and Vancouver, the brand new community of Concord Gardens was the most popular project in the City this year. Park Estates is the upcoming phase featuring a 20,000 sq. ft. Super Club and a rare park front location. With 85% sold in the West Block and North Block Phase 1 release since its launches earlier this year, homes at the Richmond Concord Gardens Park Estates will not last long.